Elizabeth Jimenez (foreground) helps sort clothing for immigrants from Central America at the Holding Institute. Jimenez was a student in the boarding school at Holding, a United Methodist Women National Mission Institution. With her, from left, are Rosa Maria Narvaez, Lydia Mejorado and Elva Guzman, UMW volunteers from La Trinidad United Methodist Church in Laredo. Less than a year ago, Michael Smith found himself trying to breathe life into a dormant community center known as Holding Institute. Now he could get winded just keeping up with all that goes on there. 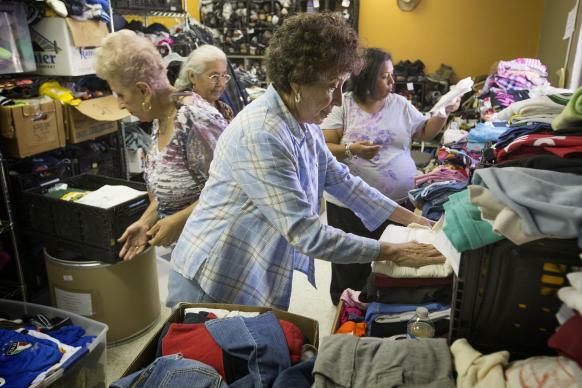 Holding — a United Methodist Women National Mission Institution with a storied past — has become Laredo’s go-to place for humanitarian relief in the summer border immigration crisis. “We’re an old battleship that’s been re-commissioned,” said Smith, Holding’s director. Since June, about 1,500 just-arrived immigrant parents and children from Central America have stopped by Holding after release from federal detention. Read the UMNS series on the border crisis and immigration. They get refreshments, a shower, toiletries, and a chance to make phone calls before moving on by bus to connect with relatives in the United States. Holding’s sprawling, one-story facility — a former lumber mill in a historic but hardscrabble part of Laredo’s downtown ­­— now teems with donated clothes, snacks, hygiene items and water bottles. Catholic Social Services from the Diocese of Laredo has set up shop here, to help meet needs. The Texas Baptist Men brought portable showers. Volunteers ­— including a Buddhist group and Methodists from Nuevo Laredo, Mexico, across the Rio Grande River — are regularly present to help with sorting and distribution. Terry Schoenert, the Southwest Texas Annual (regional) Conference president for UMW, witnessed Holding’s renewal during the challenge of coping with an immigrant surge. “They were looking for things to do to be more vital in the community, and this has enabled them to be much more vital,” she said. Holding Institute began in 1880 as Laredo Academy, a boarding school for young women from the United States and Mexico. The school was established by the Women’s Board of Missions for the Methodist Episcopal Church, South. In 1883, Nannie Holding of Kentucky arrived to teach. She soon became superintendent, overseeing rapid growth and the addition of male students. When she retired in 1913, the school — right by the Rio Grande — was renamed for her. Holding Institute would survive as a school for decades, despite being flooded out in 1954, and having to relocate within Laredo. But by 1983, financial problems forced the school to close. Holding reemerged as a community center, occupying the old lumber mill. Last year, Holding’s board tapped Smith, a bilingual, long-term resident of the area with a background in non-profit consulting, to get things going again. Last December, Holding began offering low-cost classes in English, computers and financial literacy, serving about 75 people. In late May, Smith had a request from community activist Viky Garcia. She wanted Holding to help with the swell of parents and children from Guatemala, El Salvador and Honduras who were showing up at the Laredo bus station, having been briefly detained by federal authorities, then released and given an immigration court date. While not the unaccompanied minors who attracted so much media attention this summer, they were joining them in fleeing countries beset by poverty and the violence of gangs and drug cartels. Most families were arriving in Laredo dirty and exhausted from a long and frightful journey, with little money left. Smith had doubts about expanding Holding’s mission, but agreed to provide shelter. The city reminded Holding that it wasn’t licensed as a shelter. So that service ended. But as the immigrant numbers grew through June and July, Holding joined Catholic Social Services and Bethany House of Laredo, a local homeless shelter, in forming the Laredo Humanitarian Relief Team. The team used Facebook to post updates and photos of their work. At first, Holding was the place to get showers and clothes. But because of its large property – covering essentially a city block – it took on more relief distribution. Catholic Social Services accepted Holding’s offer to relocate there, and the Texas Baptist Men brought in portable showers to supplement Holding’s rusty ones. A logbook shows 741 immigrants passed through Holding in June alone. Donations have more than kept pace, as witnessed by rooms full of clothes and other supplies. Holding has been hopping with volunteers, both individuals and groups. Some have come from long distances. Many are local. One day last week, the Rev. Jaser Davila, pastor of Aposento Alto Methodist Church across the river in Nuevo Laredo, Mexico, led a youth group in hauling in donated goods. Meanwhile, Elizabeth Gallardo-Jimenez, a 1958 graduate of Holding, sorted clothes with other UMW members from La Trinidad United Methodist Church of Laredo. Holding also has received financial help this summer, including a special $7,500 UMW grant to restore air-conditioning and assist generally. But Holding remains precarious, operating on a $40,000 budget. Hortense Tyrell, UMW executive secretary for national ministries, visited Holding last week. She alerted Smith to other UMW grant possibilities. With a year’s track record, Smith believes he’ll be able to attract support from a range of philanthropies. He notes that Holding’s classes are about to start again, with 150 students signed up. The number of immigrants coming through dropped in August. Smith wants Holding to continue to offer relief as needed, but to go a step farther, adding a resource center for those just arrived. The summer emergency did indeed prove a crucial opportunity, he said. Next: For some United Methodists in the Rio Grande Valley, helping meet humanitarian needs from the summer immigration surge became a full-time challenge.